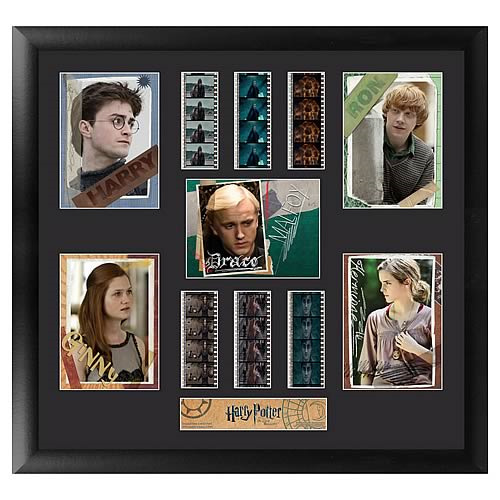 Own this Harry Potter Deathly Hallows Film Cell! Features Harry, Ron, Draco, Ginny, and Hermione. Limited to 2,500 pieces worldwide. Destroy the Horcruxes! This miraculous Harry Potter Film Cell features prints and actual cells from Harry Potter and the Deathly Hallows. It measures 19-inches tall x 20-inches wide, with all elements framed in black wood. A certificate of authenticity is included with this limited edition of 2,500 pieces. Help put an end to Voldemort's reign of terror by ordering yours now! Please note that the actual cells of film may vary from piece to piece, as they are hand selected from reels of film. In Harry Potter and the Deathly Hallows, Harry, Ron, and Hermione set out on their perilous mission to track down and destroy the secret to Voldemort's immortality and destruction-- the Horcruxes. Harry Potter is drawn even closer to the task for which he has been preparing since the return of the Dark Lord! A Horcrux is an item used by a wizard to contain a part of his soul and thereby render himself immortal.